Throughout the Fall and Winter season, butternut squash and other "winter" squash are plentiful. Butternut squash is a great vegetable for babies as it is mild, easy to digest and not a great allergy risk. Butternut squash also can be pureed into a very smooth texture for babies who are just beginning to eat solid foods. Full of Vitamin A, Folate and even Calcium, butternut and other winter squash deliver a lot of nutrition. One interesting item to note; if you give your little one an abundance of butternut squash and other foods rich in Vitamin A, you may find your baby taking on a warm and sunny orange glow! These humble and oftentimes ugly fruits (botanically speaking, winter squash are fruits but in culinary lingo, they are vegetables) can be difficult and a bit time consuming to cook and prepare. 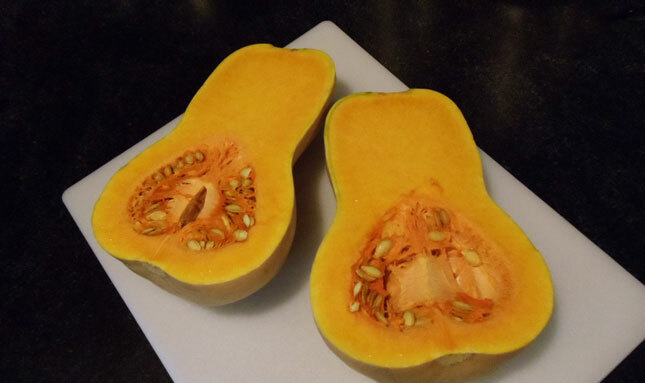 The easiest method for preparing winter squash is to roast it in the oven. Roasting will save you oodles of time and you won't have to peel a hard and stubborn shell. Step 2: Cut the squash in half Scoop out the seeds. 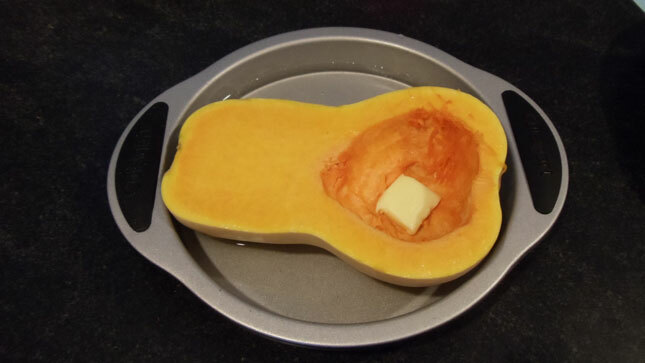 Step 3: Add an inch or 2 of water to your baking dish Place the squash (face up or down, your choice) in the baking dish. Step 4: Add a pat of butter and shake on some herbs and/or spices if desired. Step 5: Slide into the oven it goes Roast for 40-50 minutes until the shell begins to pucker and the color changes to a deeper orange. 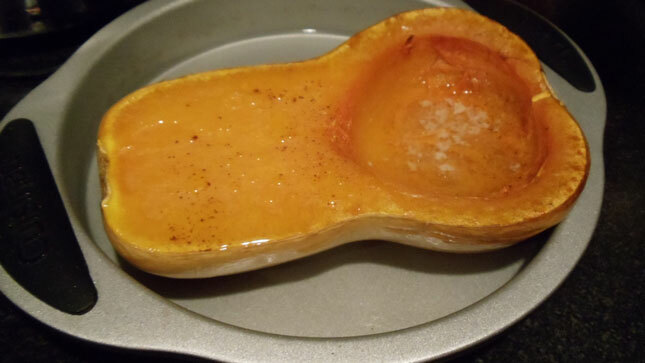 In the images above and in the roasted squash image below, you can see a slight line of delineation where the shell or rind ends and the real meat/flesh begins. On occasion, you may find that your prepared squash contains little hard strings or odd fibers. If you have scraped the meat too close to the shell, these strings and fibers may end up in your otherwise perfect squash dish. To limit and defeat these invaders, try not to get too close to the shell when scooping out the meat.